Myeloma, also known as multiple myeloma, is a type of bone marrow cancer arising from plasma cells, which are normally found in the bone marrow. Plasma cells form part of your immune system. Bone marrow is the ‘spongy’ material found in the centre of larger bones in the body. As well as being home to plasma cells, the bone marrow is the centre of blood cell production (red blood cells, white blood cells and platelets). Normal plasma cells produce antibodies (also called immunoglobulins) to help fight infection. In myeloma, abnormal plasma cells release only one type of antibody known as paraprotein, which has no useful function. It is often through the measurement of this paraprotein that myeloma is diagnosed and monitored. Myeloma affects multiple (hence multiple myeloma) places in the body where bone marrow is normally active in adults, i.e. within the bones of the spine, skull, pelvis, the rib cage, and the areas around the shoulders and hips. The extremities are not usually affected, that is the hands, feet, and lower arm/leg regions. This is very important since the function of these critical areas is usually fully retained. Some people go on to develop myeloma after having being diagnosed with a benign condition called Monoclonal Gammopathy of Undetermined Significance (MGUS). MGUS is a condition with a detectable paraprotein (like myeloma) but with no associated symptoms. MGUS may never become myeloma. The risk of transformation from MGUS to active myeloma is very low with only a 1 per cent chance each year of follow-up. If the presence of myeloma cells increases but there are still no symptoms, a diagnosis of smouldering or indolent myeloma will be made. In most cases, treatment will not be required until the myeloma cells increase further or symptoms arise. It may be a number of years before a person with MGUS or smouldering/indolent myeloma requires treatment. Regular monitoring with a haematologist is required to initiate treatment when needed. Considered a chronic, relapsing and remitting disease, treatment will be recommended during active phases until the disease has stopped progressing (stable) or is no longer detected (complete response). There then may be a period of no treatment with regular monitoring until the myeloma becomes active again. In some cases, ongoing low doses of maintenance treatment will be prescribed. Currently there is no cure for myeloma, but with treatment it can be controlled for many years. With the emergence of many new more targeted treatments, survival rates have increased dramatically. Of the approximately 1,800 Australians who are diagnosed with myeloma each year, almost all are older than 40 years. Myeloma is most common in people aged 60 years and older, and men are affected more often than women. Most of the medical problems related to myeloma are caused by the build-up of myeloma cells in the bone marrow and the presence of the paraprotein in the blood or in the urine. Common symptoms include bone pain, bone fractures, tiredness (due to anaemia), frequent or recurrent infections (such as bacterial pneumonia, urinary tract infections and shingles), kidney damage and a high level of calcium in the blood (hypercalcaemia). Although a large amount of research has been done to investigate the potential causes of myeloma, nothing has been proven to date. Exposure to certain chemicals, radiation, viruses and a weakened immune system are thought to be potential causal or trigger factors. It is likely that myeloma develops when a susceptible individual has been exposed to one or more of these factors. It is thought that susceptibility may increase with aging and the consequent reduction in immune function. People suspected of having myeloma will need to have blood and urine tests, looking for evidence of paraprotein and any other abnormalities in organ function. Scans such as x-ray, CT or MRI of the bones are also performed to determine if there are any areas of bone that have been weakened or eroded by the myeloma cells. Finally, a bone marrow biopsy – a test that involves taking a small sample of bone marrow through the back of the pelvis, will be examined under a microscope to look for myeloma cells and any genetic abnormalities that form part of the disease. What Are The Different Types of Myeloma? Myeloma is often described as being a very individual disease; both in terms of the way patients experience complications and in the way they respond to treatment, all of which can vary greatly. Some of this variation is due to the different types and sub-types of myeloma. Different types and sub types of myeloma are based on the type of immunoglobulin (paraprotein) produced by the myeloma cell. Each immunoglobulin is made up of a specific structure containing two principal components, heavy chains of which there are two, and light chains of which there are also two. Each individual immunoglobulin (Ig for short), can have only one of the five possible heavy chain types these are denoted by the letters G,A,D,E and M and only one of the two possible light chain types. The light chain component is denoted by the Greek letters, Kappa (ƙ) and Lambda (ƛ). Most people with myeloma, about 65%, have what is called IgG type myeloma. That is immunoglobulin type G (one of the five possible heavy chains), with either the kappa of lambda light chain component. The next most common type is IgA myeloma also with either kappa or lambda light chains. IgD, IgE and IgM type myeloma are all quite rare. At the same time as producing one whole immunoglobulin structure, approximately 30% of patients will also produce light chains (such as kappa light chains) on their own which are detectable in the urine rather than in the blood. These excess ‘light chains’ are also known as Bence Jones protein. 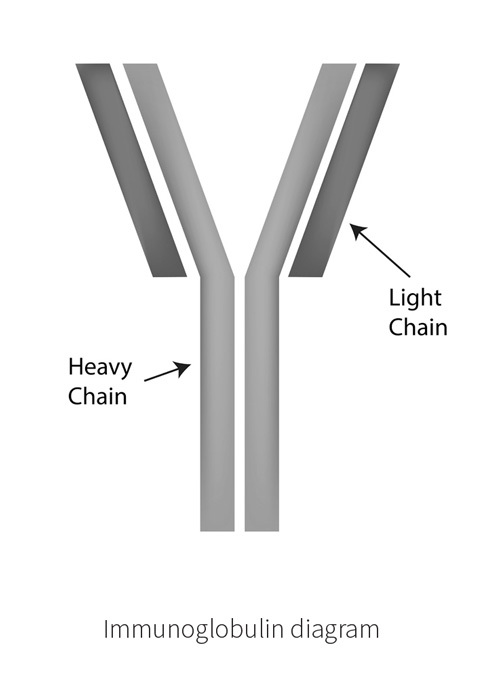 In about 20% of patients, the myeloma cells produce light chains only (no heavy chains at all). This is called ‘light chain’ or Bence Jones myeloma. More rarely, in less than 1% of cases, the myeloma cells produce very little or no immunoglobulin of any type which is known as ‘non-secretory myeloma’ making diagnosis and monitoring more difficult. In some cases abnormal plasma cells may collect in the bone or tissue forming what’s known as a plasmacytoma. This can occur in addition to other features of myeloma or on its own which is referred to as a solitary plasmacytoma. Radiotherapy can be used to treat a plasmacytoma. Sometimes multiple plasmacytomas form without myeloma being found in the bone marrow, this manifestation is treated in the same way as myeloma. The light chain or Bence Jones myelomas are the types most likely to cause kidney damage. If light chains deposit in the kidneys, nerves or other organs it can result in a conditions known as AL amyloidosis or light chain deposition disease. Regular measurements of the paraprotein and light chains are taken to help confirm a diagnosis and determine the subtype of myeloma. Measurements are also taken during the course of the disease to help determine the response to any given therapy and for periodic restaging of the disease. Non-secretory myelomas are followed using radiology to measure bone disease (usually by PET scan) and by bone marrow biopsy where indicated. How your myeloma is managed will depend on whether the myeloma is getting worse and the degree to which it has affected your body. Historically, treatments for myeloma used a combination of chemotherapy drugs, steroids and high-dose therapy & stem cell transplantation. Since the year 2000 a range of newer therapies have become available. These are not traditional chemotherapy but are classified as targeted or immunotherapy. Research is ongoing and many new drugs in this class are under development with a few new ones coming available each year. Before embarking on treatment, however, patients and doctors need to make important decisions about what treatment is best or most appropriate and when to receive it. Choosing treatment for myeloma is not a simple decision as no one treatment has been identified as being the best, and all patients are different. The advantages, disadvantages and side-effects arising from available treatments vary from patient to patient. Being involved in deciding which treatment is right for you is very important to understand why it is given and what effect you may experience. Making an informed decision is important and you should take as much time as you need to make one. However, in some situations there may be an urgent need to stat treatment, for example, if you have significant kidney damage. To help you understand more about your myeloma and the treatment options available, try to collect as much information as you feel you need from reputable sources. Information is available from doctors, nurses, other patients, the internet, Myeloma Australia and other support organisations such as the Leukaemia Foundation and the Cancer Council. Listing the pros and cons of each option is a good way to help you decide what the best treatment for you is. Talking things over with your family, friends or another patient can help clarify your thoughts. Your decision should take into account your personal priorities, your lifestyle and how you feel about the pros and cons of the treatment options that are available and their potential side-effects. The important thing is that you and your doctor agree together on the treatment you will receive. The way cancer services are currently organised in Australia means that the hospital where you are being treated should involve a range of healthcare professionals working together as a team known as a multidisciplinary team. Your treatment is likely to have been discussed by the team, although often only one doctor (usually the consultant haematologist) will look after you. Because myeloma is not common, and choosing the right treatment is sometimes as challenging for doctors as it is for patients, you may feel that you want a second opinion to be sure that the diagnosis is correct, that the treatment plan is appropriate for your situation and that all other options have been considered. Doctors are normally happy for you to seek a second opinion and you should not feel that asking for one would offend any of the medical team. Your hospital doctor or general practitioner (GP) may be able to recommend another myeloma specialist for you to see and provide you with a written referral letter outlining your current situation and plan for management. A second opinion can be obtained through the public health care system, although some people prefer to go privately. A referral letter from your present specialist or GP would be required when attending a second opinion. You can usually call and make an appointment with another doctor by phoning their secretary. Sometimes people have difficulty in communicating with their doctor and want the chance to talk to another doctor. In this circumstance, you may ask to see a different doctor in the same hospital or to have a second opinion in another hospital. What if I don’t want any treatment at all? Some patients feel that they do not want to have any type of toxic treatment and prefer to try an alternative approach such as dietary control, etc. Unfortunately there is no reliable evidence that these alternative approaches work, although there are rare reports of patients using these techniques living with the disease for longer than originally predicted. It is important to remember that conventional treatments have been well tested in clinical studies and doctors have a clear understanding of how they work. The same cannot be said for alternative approaches. If you choose to use alternative ways of trying to control your disease, it is important to discuss this with your doctors as there are potential risks involved and you may choose to try conventional treatment at a later date. If you choose not to have active treatment for your myeloma there are supportive measures available to help alleviate the symptoms of your disease. If specialist advice is needed with regard to symptoms such as pain, it may be helpful to be referred to a palliative care specialist, who will be able to provide expertise in symptom control and supportive care. The decision to start or not to start treatment is an important one. Not everyone diagnosed with myeloma will need treatment to control his or her myeloma immediately. Some myelomas lie quiet for years and these patients are monitored regularly for signs of active disease developing. Because currently available treatment is not curative and has side-effects it is usual to wait until the myeloma is actively causing problems before starting treatment. Results from the tests and investigations, along with other individual factors, will help determine when treatment should begin what that treatment should be and provide a baseline against which response to treatment and disease progression can be measured. There is overlap between categories, since treatment that controls your myeloma will reduce the complications and symptoms you experience from the disease, but will need the treatment side effects managed. What can be done to lessen the effects of the myeloma and its treatment on my body? Antibiotics, anti-virals, anti-fungals may be given to reduce the chance of a severe infection. These are usually given when anti-myeloma treatment is being taken or if the immune system is very low. At any stage of the myeloma treatment trajectory, the specialist may offer a clinical trial. The best and safest way to test any new drug or compare different types of current treatment is as part of an approved clinical trial. All patients involved in these trials are closely monitored. The information collected during the course of the trial is combined and analysed by trained researchers. The results will help to determine which are the best treatments and the most appropriate doses, to help improve care for patients in the future. Phase II trials use a larger group of patients, and look at the size of the response obtained and its efficacy compared to previous standard treatments. Phase III trials use larger groups than Phase II. They are randomised and compare the best current standard treatment to the new treatment. The new treatment will have been proved effective in the phase II study and the effect will be at least as good as – and sometimes better – than the best current standard treatment. Phase IV trials are carried out after the new treatment has been introduced into everyday use. They continue to test the new treatment so as to collect information about its effects in various groups of patients, as well as any side effects associated with long term use. As more is discovered about experimental treatments, their role alongside more established treatments will become clearer. In time, if proved to be more effective and safer, they may replace some of the existing treatments. However, as not all new treatments are better than standard treatments, it is important to carry out clinical studies to test these new treatments thoroughly. Each clinical trial will have a set of inclusion and exclusion criteria. This ensures the participants are at a similar stage in their treatment trajectory and the results will be consistent. It is due to this need for consistency that not every clinical trial will be suitable for everyone at one time. Also, not every clinical trial will be open in every centre. Hospitals and clinical trial operators will communicate with each other when planning to open clinical trials to ensure there is minimal duplication in one area. To participate in a particular clinical trial, it may be necessary to change hospitals for the duration of the clinical trial.